Pear butter isn’t “butter” in the true sense of the word. 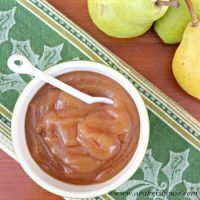 Dairy free, this pear butter is apple butter’s cousin– a deeply spiced puree of fruit easily made in the Instapot or Crock Pot. Pear butter will find its way into your meals in unexpected ways. Yes, this fruit spread is perfect for toast but it also it an excellent replacement for mayo, a topping for pancakes or waffles, or a filling for a trifle. Turning fruits into a smooth, concentrated sauce or condiment of sorts is SO easy with the help of the crock pot or Instapot. All that is required is good-quality fruit, a small bit of sugar, and spices of your choice. I’ve made apple butter and pumpkin butter in recent weeks. Today I’d like to share this pear butter. Spread it on top of toast or along side a pork tenderloin. This pear butter complements a variety of foods. How will you use it? Let me know! I used Martha Stewart’s recipe for apple and pear butter as my starting point but omitted the apples. Fragrant pear butter is easy to make using a slow cooker, Crock Pot, or Instant Pot. Remove the cinnamon stick, let cool slightly then use a hand-held immersion blender puree to desired consistency. Ladle in to mason jars. Keep refrigerated for up to 3 weeks. Please note that A Baker’s House, LLC uses affiliate links which means that I earn a commission if you use the links provided. This is at no additional cost to you. Have never thought of using pears this way, but often use crab apples, as well as apples and plums this way. It’s a great way to use up surplus fruit in the Autumn(Fall). I use it with pork, poultry and it’s great on toast with grilled cheese on top! Oh I haven’t tried plums yet– that sounds wonderful! Plums with apples would be a special treat too, especially with pork. Thanks for sharing your ideas! You have gone what I lovingly call ‘crockpot crazy!’ I was asking my daughter about using a crockpot to make meals easier and she hasn’t used one in years. Thinking she needs one for a Christmas gift; the timed ones with multiple heat settings make all the difference in the world for someone gone all day. 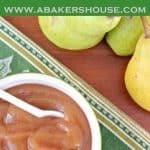 I love apple butter; wonder why I’ve never thought to make it. BTW…making goat milk caramel sauce this week; hoping the caramel version might sway some non-goat milk/cheese folks (and help us use more of the 8 gallons of milk still left!). I have, it’s true! I really have gone overboard with the crock pot and there’s no end in sight! I can only guess what all you will make with all of that goat milk! I was so impressed with your cheese. Can’t wait to see what you do next. This looks DIVINE! It sounds so delicious and your photo is lovely. Can’t wait to try it! Thanks, Emily! you can’t go wrong with something this basic where the crock pot turns fruit into something extra special. I hope you enjoy it! Great information Holly. I’ve never made any type of butter. You’ve inspired me. Thanks, Lea Ann! This is such an easy way to make use of a crock pot. Thanks for your kind comment! 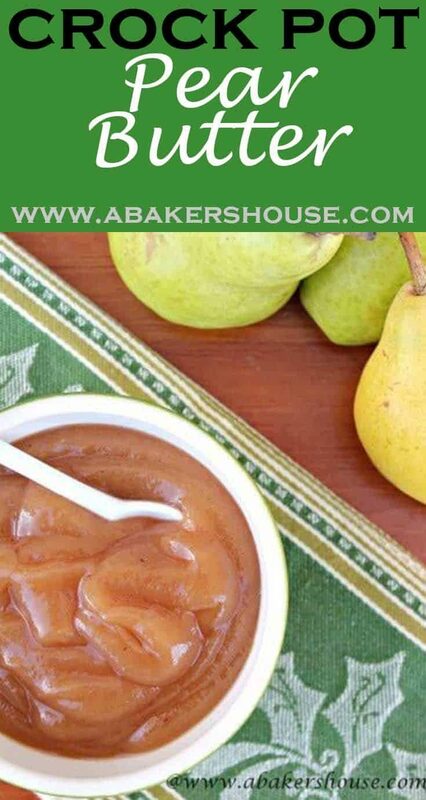 I love apple butter, but have never made or eaten pear butter. I love my apple butter on toast or with brie and biscuits. Oh I have brie in the fridge– now I know what to have for lunch tomorrow. I have a very full crockpot full of pears simmering now. I didn’t even peel them. I quartered the clean ripe pears and removed the stems. I loaded my nutri-bullet juicer with them and a bit of pineapple juice. They immediately transformed into the consistency of applesauce. I will be adding lemon juice and brown sugar to the fruit so I can safely can them in a water bath. I have a crockpot of pears simmering. I did not peel them. I cleaned and quartered them instead and removed the stems. Then I put the sections and a bit of pineapple juice in a nutri-blend juice machine. I did small batches until the pot was full. I will be adding lemon juice for the acid necessary for safe canning in a water bath. Oh I bet your home smells wonderful right now! Pears in the crock pot sound perfect today!